Drew Hines is a musician based in Pine River, MN. A lifelong student of music, his first gig was at the First Baptist Church in Lumberport, WV 1961. It was Christmas eve. He was four years old, and sang an 'a capella' version of the classic 'Silent Night'. He has covered a lot of musical ground in the ensuing years, playing in various ensembles of folk, funk, jazz, classical and marching. He plays and sings a variety of musics. Ask for a 'folk tune', and you may get a Child Ballad from the 1500s or a James Taylor tune for the 1970s. 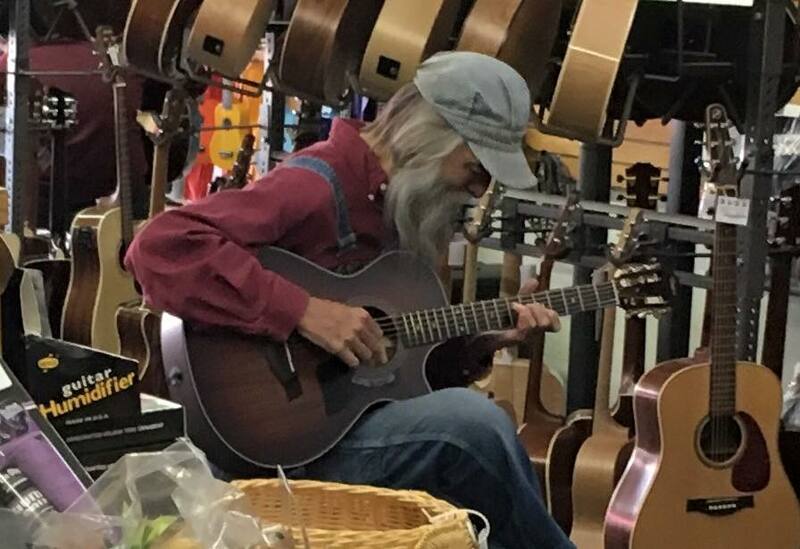 Drawing primarily from standards, old country and blues tunes- his puts a unique fingerstyle spin on songs he's honed in over forty years of performing. He has studied with acoustic greats such as Roy Book Binder, Howard Armstrong, Paul Geremia, John Jackson, and John Cephas. An east coast native, he responded to a misheard Garrison Keillor plea in 2001; he loaded the wife, beagle, and 14 working guitars into a Ryder truck and came to the Land O' Lakes. His only 'regular' gig these days is at the Good Samaritan nursing home, but he can sometimes be found in some off the path Legion club, bemusing the regulars with his 'human jukebox' routine. He can also be found playing at the Pine River Market Square on Fridays through the end of summer. He'll also be happy to do the same in your living room- as a viable alternative to those pesky, noisy DJs. Also available for guitar and mandolin guidance.